Usually I beam the warp on by myself. If Gene is wandering about I'll have him help since it usually goes pretty quick. 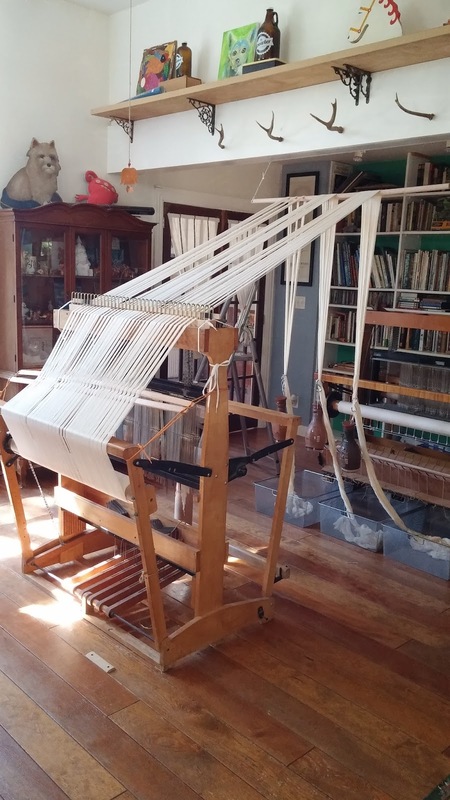 The warp I wound an age ago for cotton and hemp bath towels wasn't going to be quick or easy. The American Maid brand 8/2 cotton from Lunatic Fringe is beautiful and soft. A very light, almost squishy feeling 8/2 that likes to make a bit of fuzz and grab it's neighbor. It demanded to be beamed on under tension and at almost 12 yards, the yank and crank method would have taken forever. I gave Gene a choice, put up that warping valet bar I sketched months ago or stand there keeping the warp under tension. He chose wisely and got his drill out and we pieced together my simple valet in about 10 minutes. Now it helps that I have some huge beams that run through the house. I need nothing more than a little one step stool to reach comfortably and the texsolv and pin design at the end is easy and adjustable. I got this warp on in about 35 minutes including coffee. Three threads ( 6 ends) broke but in this 700 end spot weave warp it is unlikely they will matter much. 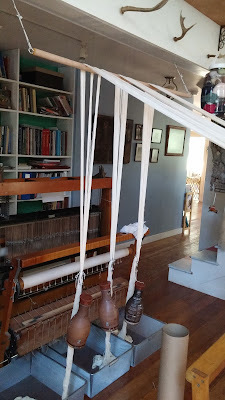 It took me far longer on Monday afternoon to add the additional new heddles to all four shafts of Nora, and much more swearing. 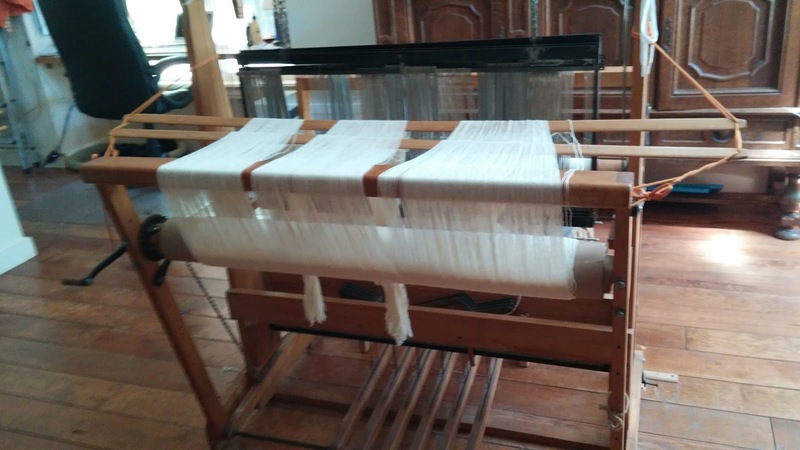 The valet bar will serve both looms. Nora, I had to turn around, Nick will have to be shifted a bit towards the bookshelf wall. Easy enough. 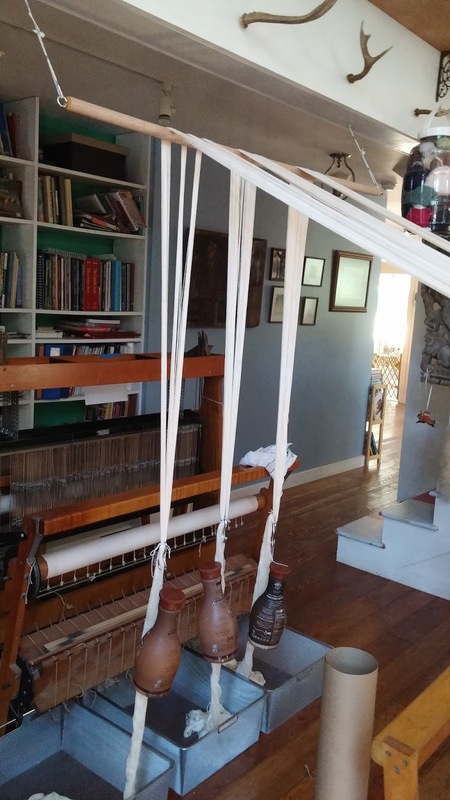 The Christmas runner warp in linen and hemp has also been wound onto Fiona. It looks pretty messy right now but will calm down when under some tension. 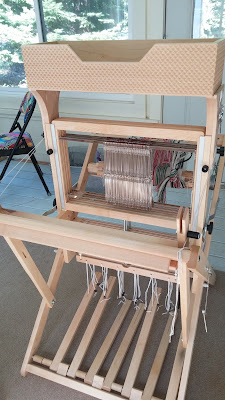 I have to add some heddles to all her shafts in prep for threading. 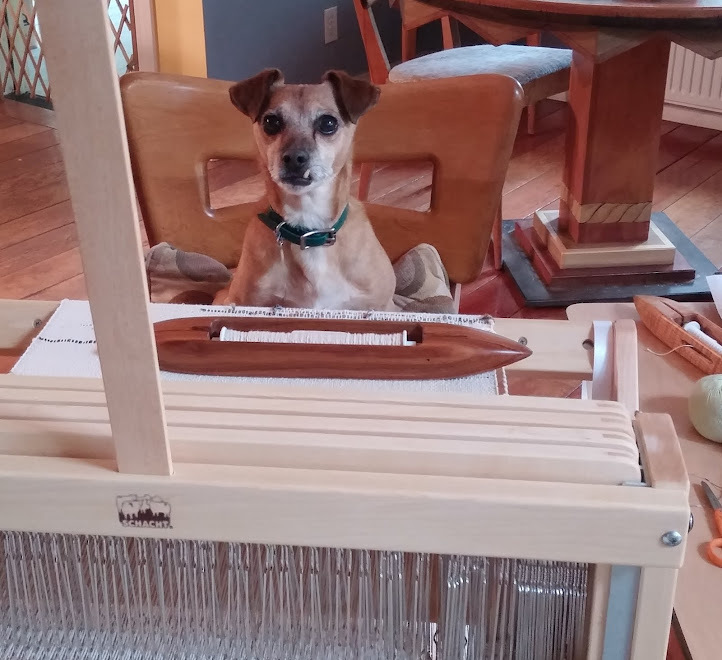 The extra heddles came yesterday. I might tackle it today or wait until the weekend. I ended up not going to spin at the fair with Cindie. Last week was incredibly hot and dry up here with temps in the mid 90's and humidity around 20% or below. Between itchy dogs, terrible heat and red flag warnings, I decided that being almost 2 hours out from home was just too much should a fire break out. Gene as fire chief would have to go and that would leave the animals vulnerable. And speaking of vulnerable, Louisiana, who has had much more than its fair share of devastation. I live a long way from that wonderful state, but enjoyed the time I was able to spend there. I can't be there now but I can help. I can send money and heaven knows, those folks are going to need a lot of it. As is my way, I give first and foremost to animal causes, as local as possible. Critters have no say over where and how they live. 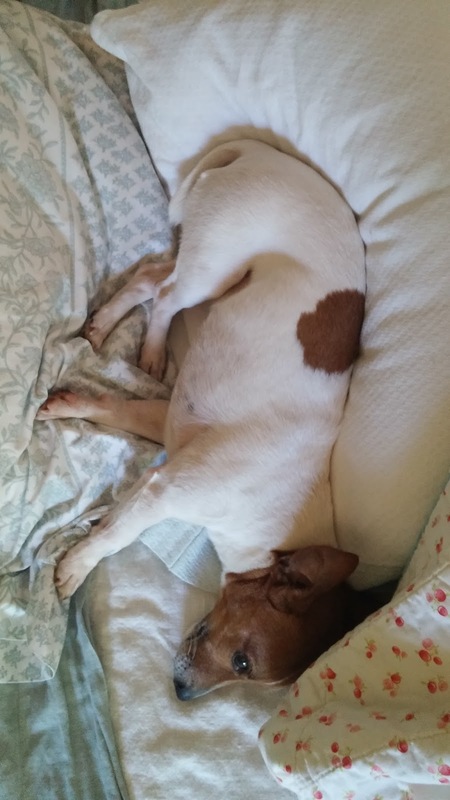 Here is a set of links for needy rescues trying to cope with the overwhelming number of displaced animals. There are also links to people centric organizations and their needs. Either way, if you can spare some now and spare some in a few months do it. It'll make you feel good, really. I stayed home and canned peaches. Two jams, one a simple one and one a variation with almond extract. I also put up a few pints of boozy peach halves with bourbon. This morning, I am using some of my home grown jalapeños and putting up the last batch of now ripe peaches as a sweet and hot Peach Jalapeño Jam. and some fun panel fabric from Moda made it up into the stash. One piece has small panels, the other large. I watched those baby raccoons one evening from the upstairs window, play on our deck, fight over sunflower seed and splash in the low bird bath. They had a ball and so did I. Momma raccoon, I'm not so sure but she is certainly attentive, and protective of her brood. Parting shot: Too hot for covers or companions but pillows are mine. All mine! Installing the hooks for my warping valet was the first thing I did in my new studio when I moved. I don't know how I ever warped without it! 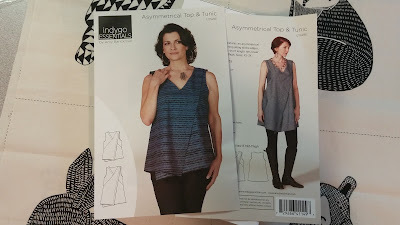 The asymmetrical tunic pattern looks really interesting. I like your fabric choices too. 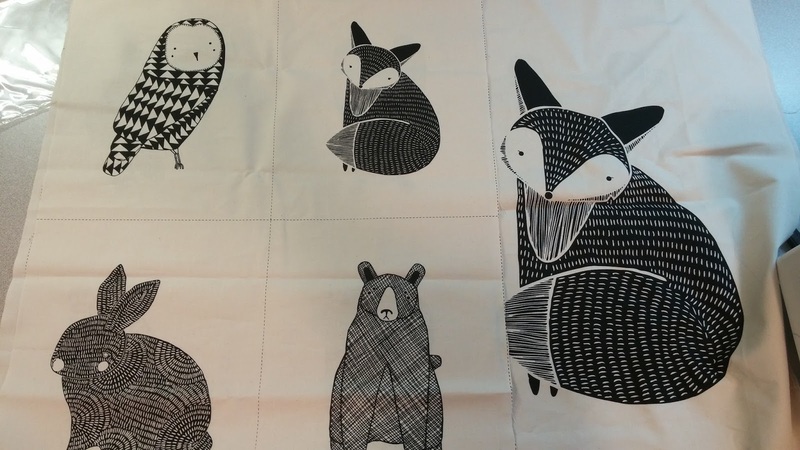 I found an Etsy fabric shop you may like-Moona fabrics out of Seattle. I agree with Mary - that tunic looks like a great design. I will look forward to seeing your make of this! Your warping valet is a work of art...and it WORKED!!! Thank you for providing the links for our neighbors in LA...I'm sure their fur babies will appreciate our help. 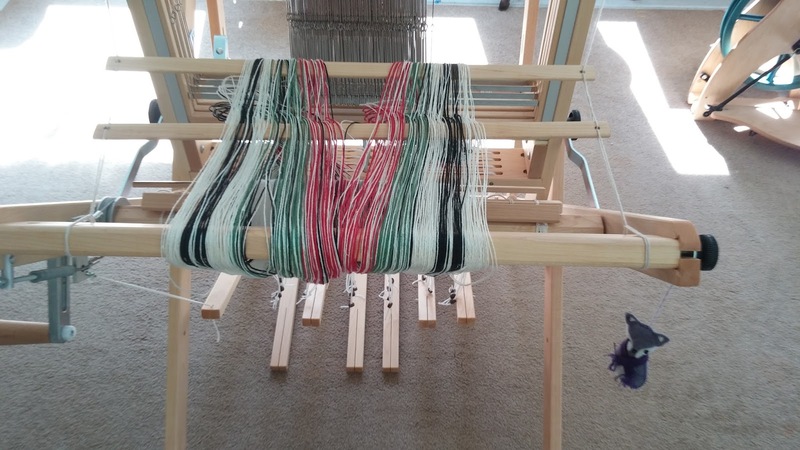 I love my warping valet and know you will love yours - it is such a great method to put a tangle free warp on a loom. Pets for the hot and itchy crew. I love the tunic, and I'm jealous of the valet. Someday, I'll have one, and have time to use it. Too busy milking goats and making cheese right now!! Laura! Good to hear from you!! Glad the goats and cheese making is going well. The "valet" is nothing more than a thick dowel with an eye hook at either end. Two open hooks in the beam, two lengths of texsolv and two of the arrow pins. LA, A work of art! Well, maybe stick art! I'm betting any and all help would be appreciated. Some places have amazon shopping lists if one is uncomfortable with cash. Martha, I like the design, the execution looks a bit funky, this is going to be made from an old sheet first, a true muslin. Mary, Thank you for the fabric shop tip. Sandy had that cheater fabric from Moda, she'll make quilts from it of course, but the foxes were too cute to pass up. That warp thing is genius! I don't have a Gene around to help, but I can make one of those valets!